A Russian Progress supply ship loaded with 2.9 tons of supplies and equipment vaulted into orbit Wednesday, chased down the International Space Station and glided to a picture-perfect docking to close out an autonomous four-orbit rendezvous with the lab complex. The cargo ship's Soyuz booster ignited on time at 11:26 a.m. EDT (GMT-4, 9:26 p.m. local time), quickly pushing the spacecraft away from its firing stand at the Baikonur Cosmodrome in Kazakhstan. Seconds after liftoff, the rocket knifed through a layer of low clouds and disappeared from view, but NASA launch commentator Rob Navias said telemetry from the spacecraft showed rock-solid performance as it continued its ascent. The eight-minute 45-second climb to space went smoothly and the Progress M-23M supply craft's solar arrays and navigation antennas deployed as planned moments after separation from the booster's upper stage. "A flawless launch and ascent," said Navias, monitoring the flight from mission control at the Johnson Space Center in Houston. "So far, so good, for the Progress 55 (mission)." Following a fast-track six-hour rendezvous, the Progress M-23M cargo ship moved in for a radar-guided docking at the Russian Pirs module at 5:14 p.m. as the two spacecraft sailed 260 miles above the Pacific Ocean just off the coast of Peru. 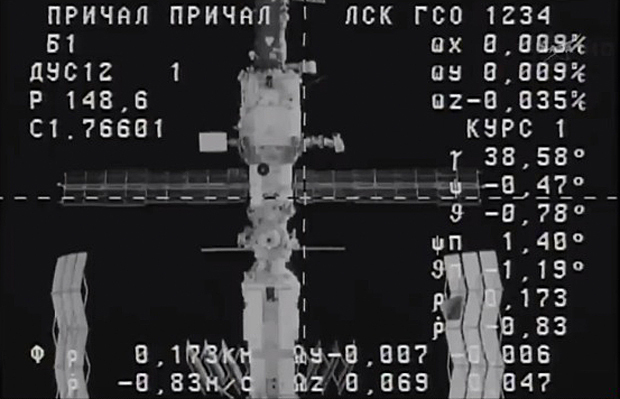 As always with uncrewed Progress dockings, a Russian cosmonaut aboard the space station monitored the approach from a control station in the station's Zvezda command module, ready to take over by remote control if any problems developed. But the launch, rendezvous and docking were virtually flawless, and Russian mission managers radioed their congratulations to the station's crew, saying the flight was one of the smoothest in recent memory. "Again, a huge thank you and congratulations for the excellent work," a Russian called up from the flight control center near Moscow. 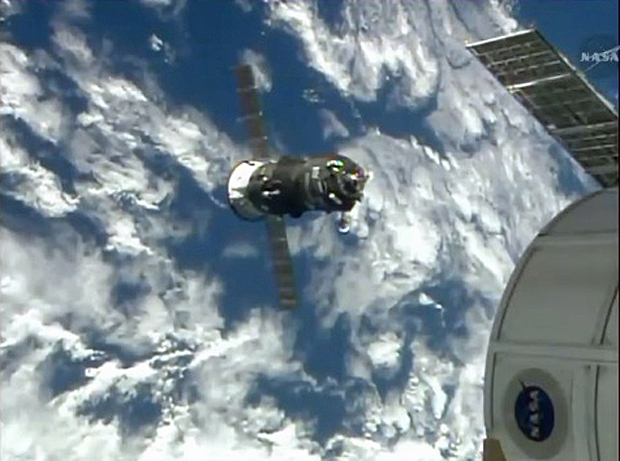 "Thank you for your nice words," one of the station cosmonauts replied in translated remarks. "Congratulations to everyone, because it was a joint activity. It's great to see our joint effort has been so successful." The Progress M-23M spacecraft is the 55th Russian cargo ship launched to the space station since assembly began in 1998. The cargo ship was loaded with 1,764 pounds of propellant for the station's maneuvering rockets; 105 pounds of oxygen; 926 pounds of water; and 3,126 pounds of experiment hardware, spare parts and crew supplies. Expedition 39 commander Koichi Wakata, Mikhail Tyurin, Rick Mastracchio, Oleg Artemyev, Alexander Skvortsov and Steven Swanson plan to unload the cargo ship over the next several days and weeks. Next up for the space station is launch of a commercial SpaceX Dragon cargo ship Monday that is loaded with 4,600 pounds of equipment and supplies. Liftoff from launch complex 40 at the Cape Canaveral Air Force Station in Florida is targeted for 4:58 p.m. Monday, setting up a two-day rendezvous with the station. If all goes well, the station's robot arm will latch onto the uncrewed Dragon spacecraft around 7:11 a.m. Wednesday, pulling it in for berthing at the Earth-facing port of the forward Harmony module. Launch originally was planned for last month, but the flight was delayed, first by concern about possible contamination in the spacecraft's unpressurized cargo section and then by a short circuit that damaged critical Air Force radar tracking equipment. The contamination issue later was dismissed, but work to repair the U.S. Eastern Range tracking gear delayed the SpaceX flight as well as launch of a United Launch Alliance Atlas 5 rocket carrying a National Reconnaissance Office spy satellite. With the tracking network back in operation, the Atlas 5 is scheduled for launch from complex 41 at the Cape Canaveral Air Force Station at 1:45 p.m. Thursday. If all goes well, the SpaceX Dragon will follow suit Monday.